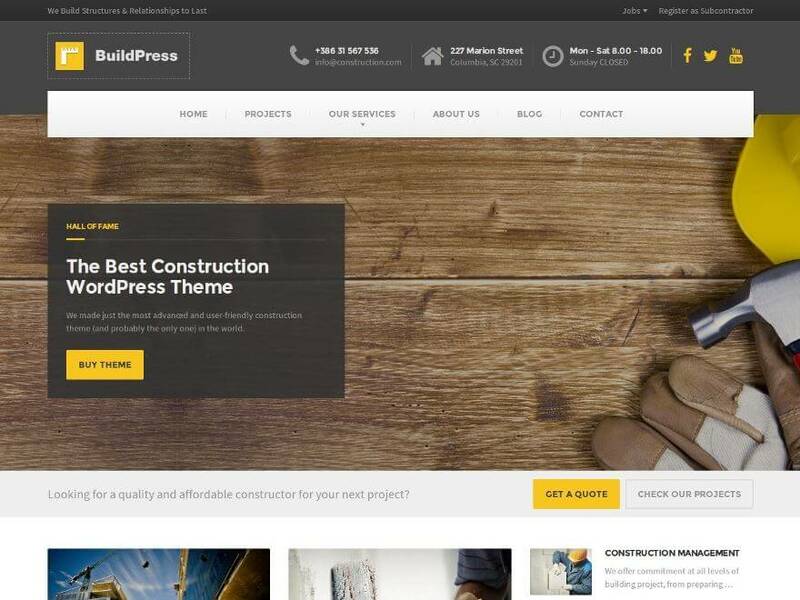 BuildPress is a premium WordPress Theme for any kind of construction businesses and companies. It is our most advanced and sophisticated theme we built so far. It is very easy to setup and use with one click demo content import. Available only on ThemeForest! Congratulations! Now the BuildPress WP Theme is installed. Once you select which demo data you want to import, just click on the Import button. Don't forget to activate all required plugins before importing demo data. To import the demo data go to Tools » Import, click on WordPress (install the WordPress Importer plugin if not already installed) and upload/import the previously saved xml file (don't forget to enable the Download and import file attachments checkbox to also import the images). Rename this file to widgets.wie (mind the file extension) and use it in the plugin Widget Importer & Exporter. Go to Tools » Widget Import/Export and import the file. Install and activate the Customizer Export/Import. Go to Appearance » Customize » Export/Import and import the file (also enable the Download and import image files? checkbox, to import pattern images). If for some reason these URLs are not available, then all you need to do is download the All files & documentation zip from ThemeForest and you will find these files in the extras folder. Voila, the new BuildPress skin and the new 2 Essential Grids are imported. Go to Pages » Front page, edit the Widget called Essential Grid and choose Essential Grid: Projects. Copy shortcode of the Essential Grid Projects Page and paste it to the page Projects. On the left side you can put Site Tagline Appearance » Customize » Site Title & Tagline, very useful for slogans. On the right side is the top menu area so you can make new menu in the Appearance » Menus. You must choose Top Bar Menu theme location and that's it. What if i don't like Top Bar at all? No problem, you can hide it in our Theme Options in customizer - Appearance » Customize » Theme Options » Header & Breadcrumbs » Top Bar Visibility. With widget Icon Box you can put any kind of title with small text and image in the header. In our demo we use this widget for contact information which we think are very important for customers. In this widget you can choose Title, Text and Icon from Font Awesome. You can also choose a link for the whole box. If you let that field empty Icon Box will not be click-able. Very easy to use widget. Insert your link to the social network and select your social network. If you want to have more than 8 social networks at once please contact our support and we will help you. You can choose between 4 different Templates - Default Template, Default Template (for Page Builder), Front Page With Layer/Revolution Slider and Front Page with Slider. Default Template: Just default template for simple layouts. Default Template (for Page Builder): This is where the magic happens. First you must choose Page Builder option under the title and you are ready to go. You can add our widgets here, choose different visual styles and much more. More about that in the next chapter. Front Page with Slider: This is an unique template which adds option for the slider in page options. It can be used with Page Builder. More about that in the Slider chapter. Front Page with Layer/Revolution Slider: We don't include this two sliders with the theme but we make sure they work since we know our customers want to use them. When you activate this template there is a new field in which you can put alias from Layer/Revolution Slider and that's it. Empty Template (no header and footer): The name says it all. This is an empty page template, without the header or footer section. It's a blank canvas that you can create a landing page, coming soon or any other typo of page. This template also has Full page background settings section, which can add full page background color, image or video. Here is an example of full page background image and video. 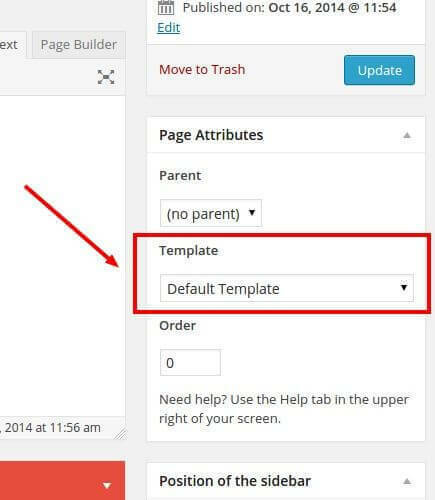 (This page template is available from BuildPress version 5.0 onwards). In BuildPress version 5.0 we introduced two coming soon pages, one with a full page background image and one with a video background. These two pages come with the original BuildPress demo import (BuildPress Classic). To set the coming soon page, so that users will see it instead of your site (which is "under construction"), you have to set it as your front page. Go to Settings » Reading and set the Front page displays to A static page (if not already set) and then select your coming soon page as the Front Page. Don't forget to save the settings. Instructions for Page Builder version 1.5.X are deprecated. See the documentation for version 2.0 below. You can make any kind of grid with adding new rows and inside them you can put widgets. When you are finished with adding widgets you can also move whole rows up and down. You can also choose between few Visual Styles of row - Default, Wide (No Container), Wide Solid Background Color, Wide Pattern Background, Wide Image Background. Default: normal most common visual style. Wide (No Container): visual style with no container. Everything you put here will go from edge to edge of the screen. Most useful for Google Maps Widget. Wide Solid Background Color: visual style with full width color for background. In our demo we use this style for showing Banners. Wide Pattern Background: visual style with full width pattern for background. In our demo we use this style for showing Testimonials. Wide Image Background: visual style with full width Image for background. In our demo we use this style for showing Motivational Text. 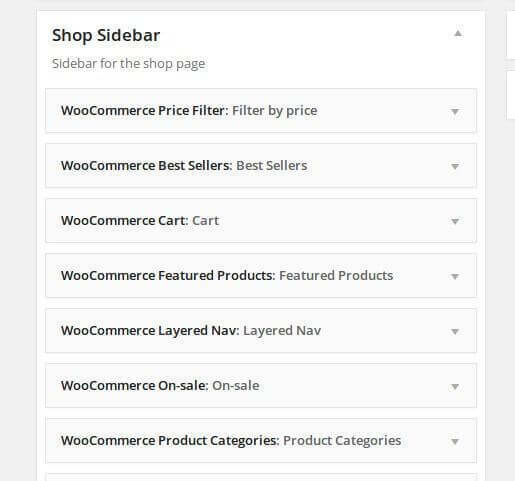 All this styles can be modified in the wp-admin » Appearance » Customize » Theme Options » Page Builder Row Styles, so you can give your own feel to the site. 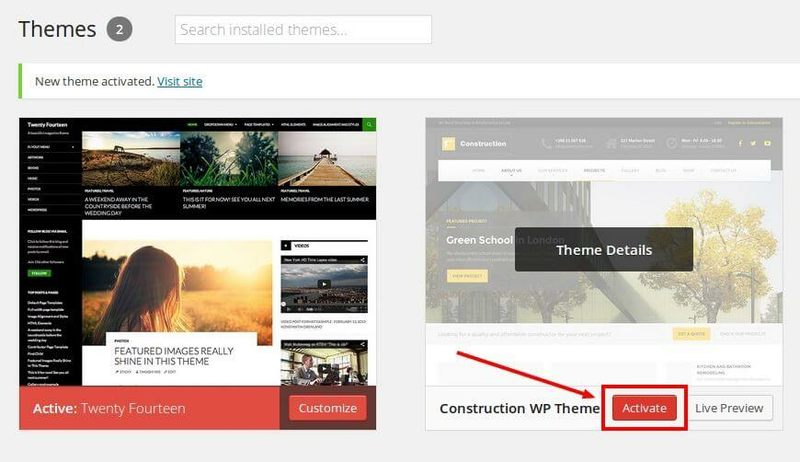 Page Builder works best with our carefully selected widgets. You can see how to use and modified them in the Widgets section. From December 15, 2014 (version of BuildPress: v1.8.1) the old version of Page Builder is deprecated. 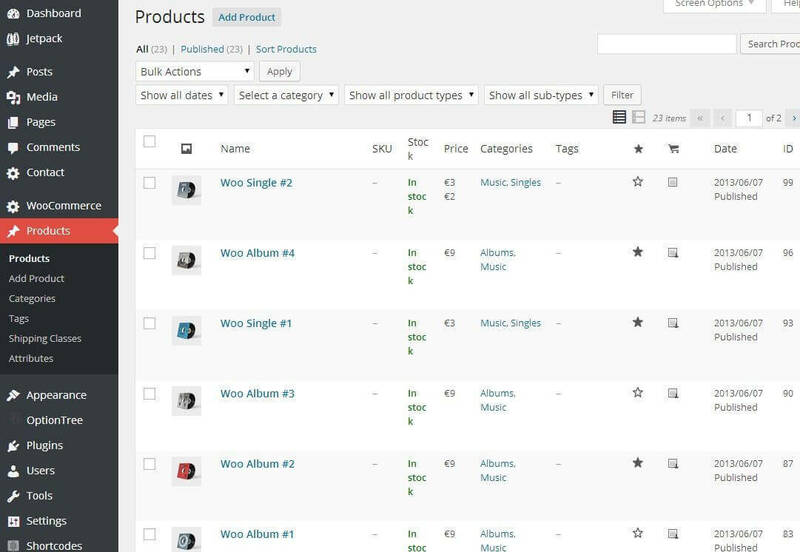 This affects the way the demo data are imported and (especially) how the front page is configured. From v1.8.1 the front page is imported, but the import doesn't work as it used to, since only the bare content is imported for the pages which use Page Builder plugin. In order to compensate that, we created a prebuilt layout called Home page. 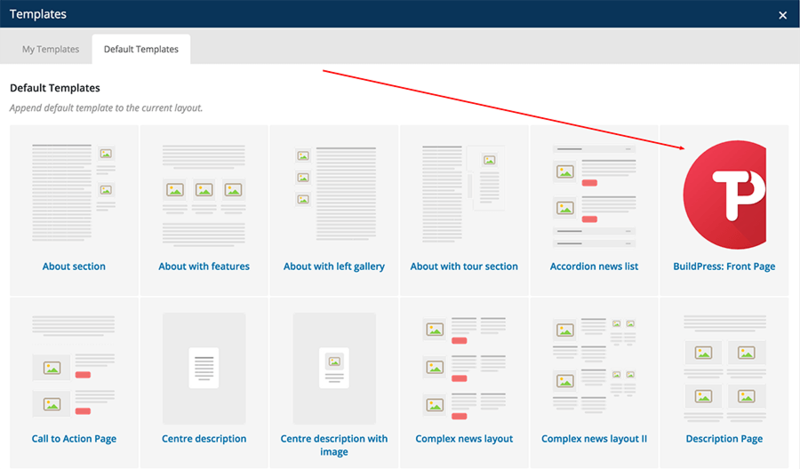 You just create a new page, select Page Builder and click to button Prebuilt Layouts. 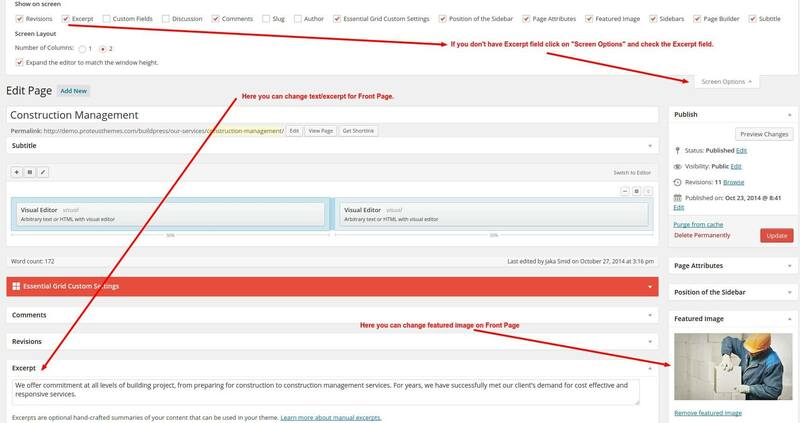 Select the Home Page and you are done (make sure you are using the page template Front Page with Slider). In the next days we will be creating a more complete and easier way to import the pages built using the Page Builder, so stay tuned. 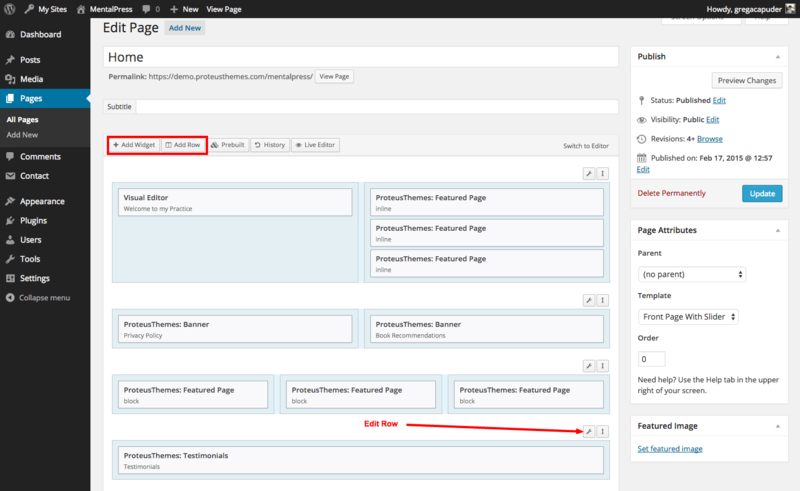 In the new version of Page Builder all row layouts work differently than before. This is why after the update all the wide elements are cropped left and right. Here is a guide on how to fix that really fast with a few clicks. You must go into Page Builder editor and Edit Row of broken row. 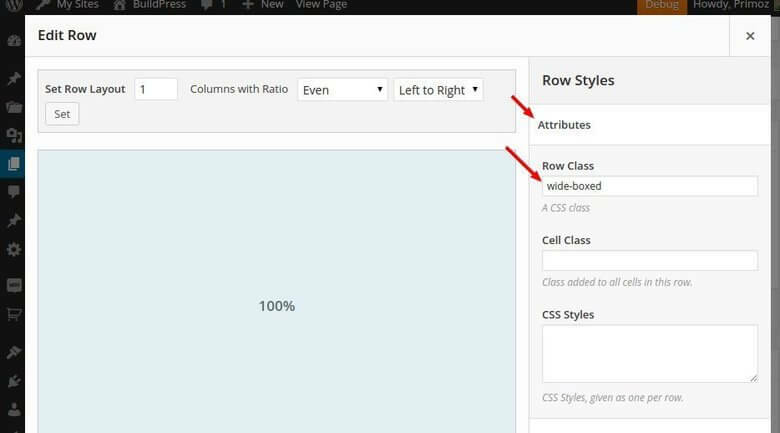 You will need to delete everything in Attributes » Row Class for each element. In the Layout options select Row Layout Full Width or Full Width Stretched (Google Maps for example). And in the Design you must choose Background Color or Background Image. If you use pattern than you must choose both. The images for background and patterns are located in the BuildPress theme in buildpress/assets/images/. The Full Width Row Layout in the new Page Builder works flawlessly. But in the boxed BuildPress some content might not be visible. One example is Google Maps where the controls for zoom and navigation are hidden when using Full Width. Of couse, we have a workaround for that. Since BuildPress v1.9.0 there is a special class you should set for wide rows when you are using boxed layout of the theme (set in Themes » Customize » Theme Options » Theme Layout & Colors » Layout). When editing row (see screenshot above) click to Attribues and enter the wide-boxed for the Row Class. Make sure that you leave the Standard layout on Layout » Row Layout when using the wide-boxed class. There are 6 options with different attributes - text, style, href and target. Style: You can choose betwen few styles - primary, secondary, danger, success, info or default. Target: You can choose if you want to open link in the same - "_self" or new - "_blank" window. Icon: You can use any of 519 FontAwesome icon. To set the selected icon, just get the title of the icon, for example "fa-phone". Tables are in fact not made with real shortcodes but very simple html tables. After that all you need to do is to add our .buildpress-table class in the <table> and that's it. 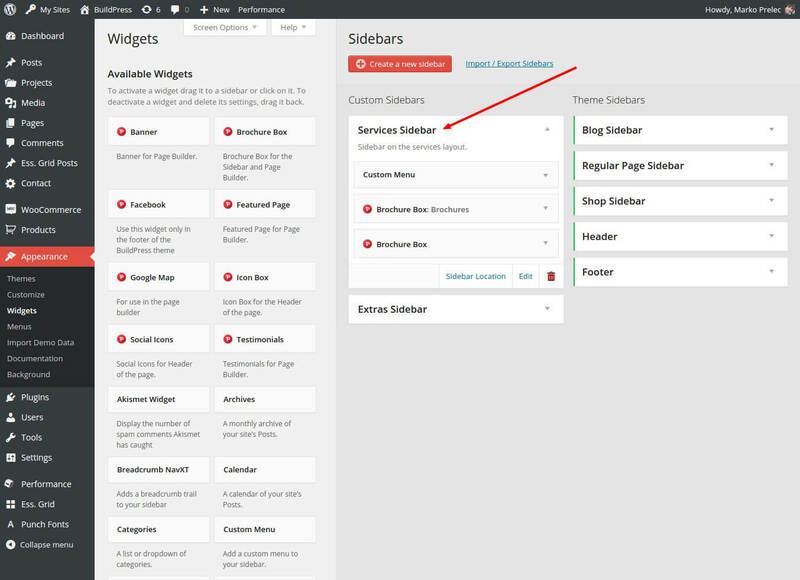 You can use almost any widget in the Page Builder. Let's take a look at few, not so straight forward ones. Visual Editor will make you the same editor environment as in normal WordPress editor. You can use that widget if you want normal text but also some of Page Builder widgets/tools. More about that widget can be found here. How to add button? With our custom shortcodes. You can find instructions on Buttons section. This one is actually normal text widget with some html code. Change source of image - src="yourimage.jpg" and your image will be shown. Why Choose Us & Who We Are? <a href="http://demo.proteusthemes.com/buildpress/wp-content/uploads/sites/16/2014/10/content_24.jpg"><img class="alignleft wp-image-115 size-medium" src="http://demo.proteusthemes.com/buildpress/wp-content/uploads/sites/16/2014/10/content_24-300x168.jpg" alt="Content Image" width="300" height="168" /></a><a href="http://demo.proteusthemes.com/buildpress/wp-content/uploads/sites/16/2014/10/content_23.jpg"><img class="alignleft wp-image-116 size-medium" src="http://demo.proteusthemes.com/buildpress/wp-content/uploads/sites/16/2014/10/content_23-300x168.jpg" alt="Content Image" width="300" height="168" /></a>Our construction management professionals organize, lead, and manage the people, materials, and processes of construction utilizing the latest techno logies within the industry. Our construction management professionals organize, lead, and manage the people, materials, and processes of construction utilizing the latest techno logies within the industry. Our construction management professionals organize, lead, and manage the people, material. Brochure box is perfect widget for all kind of documents. All you must do is to upload document, put URL in the widget and select the icon you want. After that you will get the perfect looking download box and that's it. Brochure box can be used in Sidebars or in Page Builder. If you want to see it in action, check it out on BuildPress demo page. MailChimp Subscribe widget will help you collect emails from your potential clients, so you can email them a newsletter or a promotional offer and so increase your profits. Here is an example of the MailChimp subscribe widget. (This widget is available from BuildPress version 5.0 onwards). Save the widget and update the page. That's it! The subscribe form will be generated automatically (email field and a submit button) and you will be able to collect emails. The Countdown widget is another simple widget, that can be setup in seconds. All you need to do is input the valid date and time format and it will countdown to that exact time. Here is an example of the countdown widget. (This widget is available from BuildPress version 5.0 onwards). 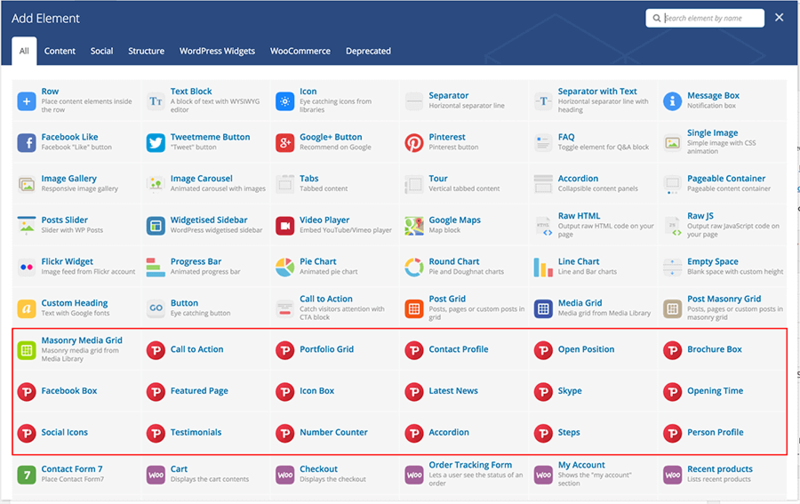 Visual Composer: Page Builder for WordPress is supported for our BuildPress theme from version 3.1 onwards, so in order to use Visual Composer, it's best to update your BuildPress theme to the latest version. (Note: We do not bundle this plugin with the theme). Lets take Testimonials as an example of the nested element. When you select Testimonials element in the VC editor a window will pop up with just some simple options and a "container" will be displayed in the editor. Now you have to click the + icon and add a Testimonial element, edit its settings (that will actually add a testimonial quote to the page). With this method you can add as many testimonials as you want. And that's why we use nested elements. The other nested element, apart from Testimonials is Google Map. It works on the same principle, it enables you to add multiple locations on the Google map. 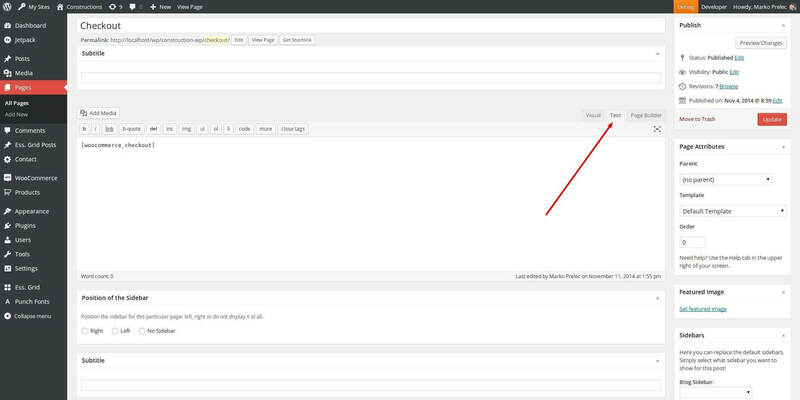 To set the correct default Project custom post type breadcrumbs, you should go to Settings » Breadcrumbs NavXT and click on the Post Types tab. Scroll down to the Project section, and set the Project Root Page to your "Projects" page (where you list all your projects), then disable (uncheck) the Project Archive Display and Project Hierarchy Display checkboxs. Save the settings. Find the documentation for the Essential Grid plugin here: Essential Grid Documentation. In our BuildPress theme we use Custom Sidebars for Services Sidebar. So instead of Regular Page Sidebar we want to show a sidebar with Our Services related things. 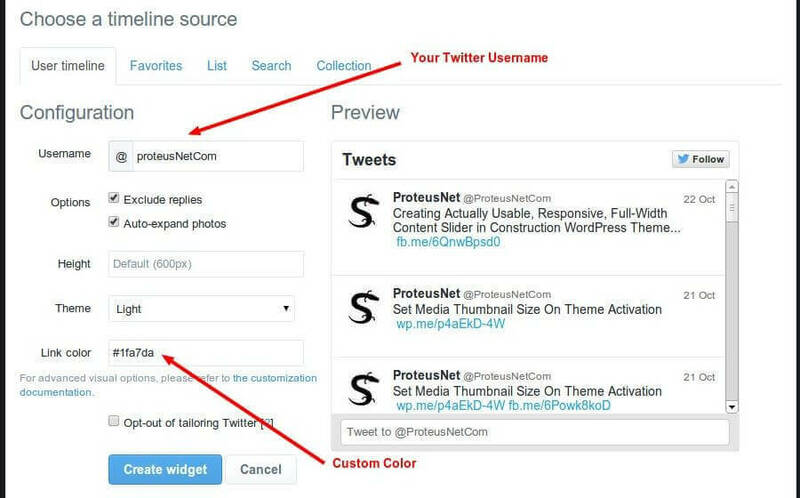 First we need to Create a new sidebar and put widgets inside like in image below. 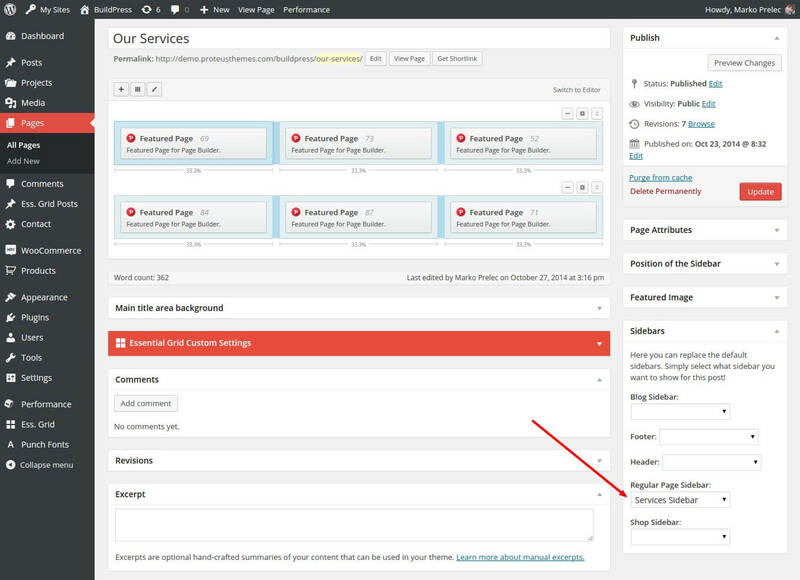 After that we need to go to our page with Our Services content and in the Sidebars section we can replace the default sidebar. Instead of Regular Page Sidebar we choose our new Services Sidebar. With this method you can have unlimited unique sidebars for every page. Last but not least there is our footer area. Footer area is divided in two - Footer Widgets and Bottom Footer. 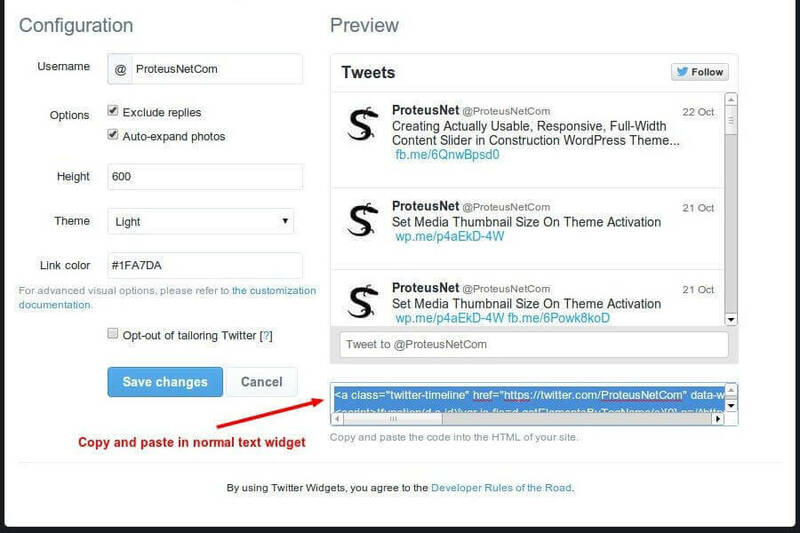 Footer Widgets is place where you can add the last things to your page. You can add widgets in the Appearance » Widgets » Footer. 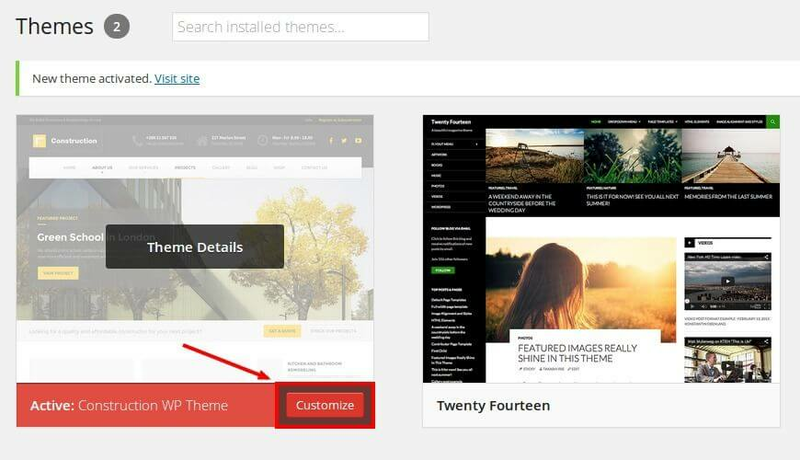 There is also few options for that area in the Appearance » Customize » Theme Options » Footer. You can choose how many widgets you want to place there or you can even turn whole area off if you choose 0. Here you can also change background pattern and all colors. Bottom Footer area is place for copyrights, some custom text or footer menu. We add Footer Menu area in left side of the bottom footer. You can activate that menu in the Apperance » Menus » Footer Bottom Menu. Custom text for both left and right side of bottom footer can be added in live customizer Appearance » Customize » Theme Options » Footer. All images used in BuildPress WP can be found on Shutterstock. 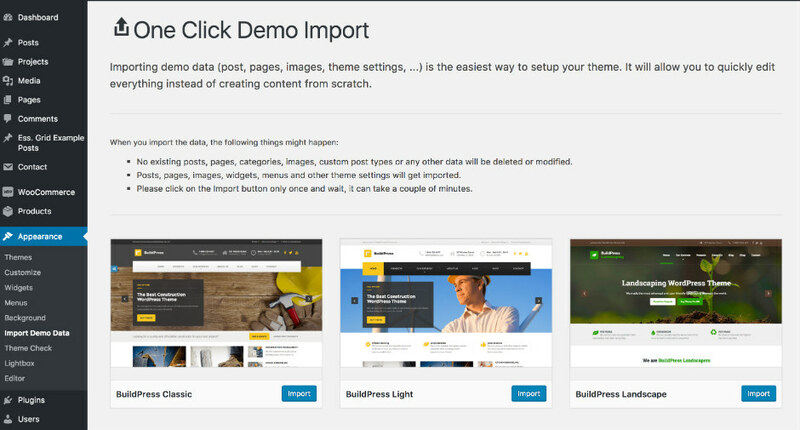 All the images shown in the demo page of BuildPress WP are copyrighted and come blurry with the theme (demo content). 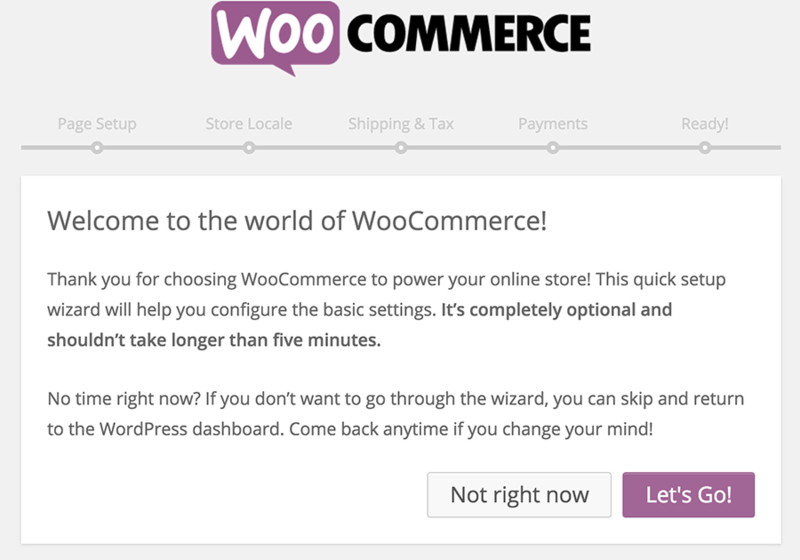 View the BuildPress WP changelog.